Java Tea, also aptly known as Cat's Whiskers because of it's awesome show-stopping flowers, is a perennial medicinal herb native to Asia. 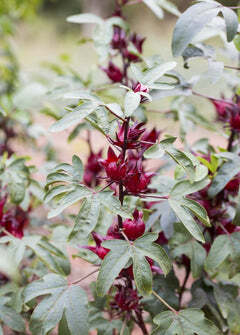 Java Tea is a rare, beautiful evergreen shrub that is full of large unique blooms throughout summer and fall. Java Tea is well-researched for it's many medicinal uses with rapidly growing commercial interest. It is a close relative of basil and the leaves are widely used in southeast Asia for urinary, kidney, and bladder issues. Java Tea may have anti-inflammatory, anti-hypertensive, antioxidant, diuretic, antimicrobial, anti-cancer, and analgesic properties. You can use Java Tea fresh, dried, or powdered. Harvest Season: Leaves are the only part used and can be harvested year-round.